Weddington is not served by any municipal neighborhood or community parks. The nearest neighborhood park is in the next town (Stallings) and is about 8 miles away. There is no community park in Union County. Union County does have an excellent regional park in the 1000+ acre Cane Creek Park which is about 15 miles away from Weddington. The nearest greenway is 12 miles away in Mecklenburg County. 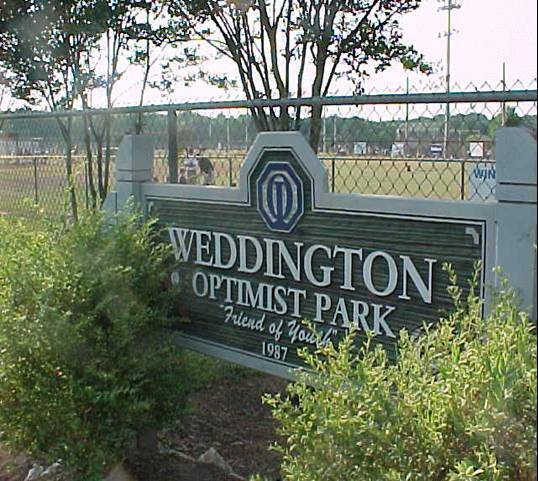 In 1987 members of the Weddington Optimist Club realized that one multi-purpose sports field behind a church was inadequate. Members located a 16 acre parcel at a reasonable price. With 10 members pledging $1000 each, the property was purchased. A visitor to one of the club meetings would have had trouble believing the vision of a completed ball park. At the time club membership was in the high teens. In 2001 the WCWAA purchased an additional 34 acres adjacent to Optimist Park to bring the total park to 52 acres.